Respect the alphabet. Support “Handselecta: Flip the Script”. March 28, 2013 on 5:29 pm | In related links | Comments Off on Respect the alphabet. Support “Handselecta: Flip the Script”. I haven’t yet read Christian Acker’s new book “Handselecta: Flip the Script”, but from what I’ve seen, it looks like a thorough, scholarly, and invaluable piece of work. He’s compiled hundreds of interviews, tags, and alphabet samples from writers across the US, in a grand taxonomy and analysis of regional handstyles, the roots of all graffiti culture. I can’t wait to read it, and I’ll be first in line when he comes to San Francisco to speak. If you’re as into this stuff as I am, you might want to show your support. 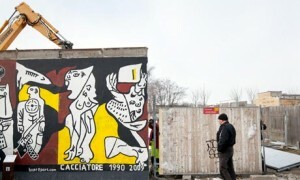 Tearing down Berlin’s East Side Gallery? March 28, 2013 on 3:19 pm | In global news | Comments Off on Tearing down Berlin’s East Side Gallery? The battle of real estate developers versus art-loving citizens plays itself out again, this time in the city of Berlin. I’m old enough to remember when the Berlin Wall came down the first time. Then, it was something to celebrate. Now, it’s something to protest against. How times change.